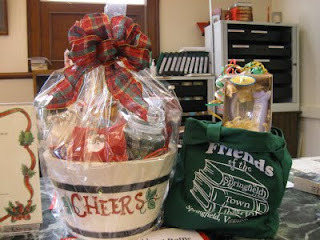 The Friends cordially invite everyone to their "Open House" on December 4, 2009, 5:30 to 7:30 p.m. After Santa's downtown arrival join friends and neighbors at the library for refreshments and the gift baskets drawings. There are two baskets; one for children and one for adults. Each gift basket is full of gifts and gift certificates from local merchants such as: maple syrup, ornaments, Yankee Candle, music CD, stuffed animal and books of course! Raffle tickets are available at the library $2.00 per ticket or 3 for $5.00 for the adult gift basket. We encourage all children to come to the library during the Open House and fill out a free entry form for the children's gift basket. For fun, refreshments, music and raffle drawing please join us on December 4 at the library! The Friends of the Springfield Town Library would like to thank those merchants who donated gift certificates or other basket goodies.